It's a tough time to be a traditional razor maker. As well as the rise of men having beards, and disruptive subscription razor services, Gillette has spent the last decade bogged down in a willy-waving facial arms race with Wilkinson Sword to see who can pack the most blades and mechanical gizmos into its razors. However, Gillette is now appealing to more sensitive customers with its adverts, and more sensitive skin with its new razor, aptly named SkinGuard Sensitive. We've been using one for the last month, and we are seriously impressed. As you can see, there a few obvious differences between this and previous Gillette razors. There's only two blades, and they're separated by a 'SkinGuard bar'. The other obvious change is that the lubricating strip usually found on Gillette and other razors is now a lubricating rectangle, positioned above and below the blade array. A third of British men consider themselves to have sensitive skin, but even if you don't, the SkinGuard Sensitive undoubtedly gives a very comfortable shave. To this end, the pair of sharp blades are coated for 'low cutting force', and positioned so that hair is only pulled and cut twice in each stroke, reducing tug and pull. 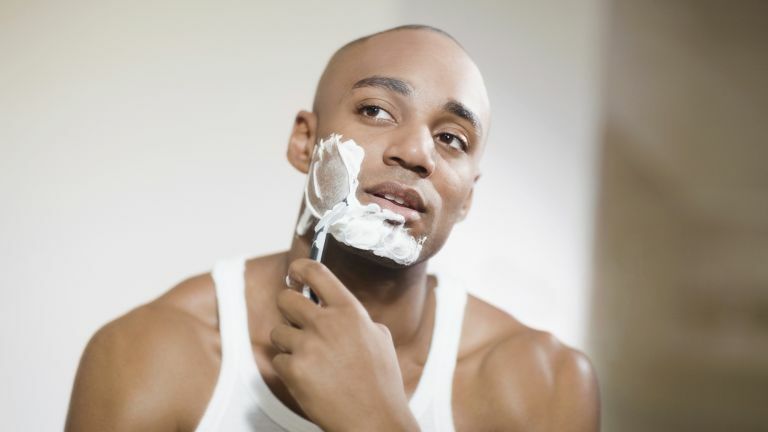 The result is a shave that's at skin level only, whereas butch, multi-blade razors actually cut below the level of the skin, which is what causes irritation to those with sensitive skin. We found that, used daily or every couple of days, SkinGuard Sensitive gave a smooth shave without any soreness or redness. The design does slightly resemble a body shaver, and it is indeed excellent for manscaping, removal of bodily hair you don't want and 'tidying your downstairs'. However, we would not recommend trying to shave a week's worth of beard with this, as you'll be there for hours. We tried just this on one occasion, so we know what we're talking about. It's also important to store this razor somewhere dry, or that over-sized lube-strip will degrade rapidly. That aside, if you have sensitive skin or just want an easier, less severe shave, SkinGuard comes highly recommended from T3.